International Partnership for Human Rights (IPHR) has joined over 20 other human rights NGOs in appealing to the Georgian Prime Minister over the case of Afgan Mukhtarli, an exiled Azerbaijani journalist who was abducted in the Georgian capital Tbilisi on 29 May 2017 only to resurface the following day in Azerbaijani custody. Currently he is in pretrial detention in Azerbaijan on charges of smuggling, illegal border crossing and using violence against police. 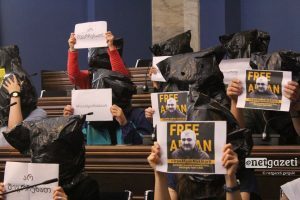 The signatories to the NGO letter state that “this disturbing development does not only expose Afgan Mukhtarli to the possibility of torture and a long prison sentence, but also sets a worrying precedent, threatening the security of dozens of other Azerbaijanis living in exile in Georgia”. They point out that this case “is a black stain on Georgia’s reputation as a leader in upholding human rights standards in the Caucasus region” and call for ensuring that the investigation opened into abduction of Afgan Mukhtarli identifies all those responsible, including possible Georgian officials who were implicated. The NGO signatories stress that a “clear message” needs to be sent that illegal abductions such as this one will not be accepted on Georgian territory.